NASA astronaut Shannon Lucid, the only American woman to live aboard the Russian Mir space station, and a member of NASA's first astronaut class to include women, has retired after a long and outstanding career at the agency. Lucid's time at NASA spans more than three decades, which includes five spaceflights. In total, she has logged 5,354 hours, or more than 223 days, in space, agency officials said in a statement. From August 1991 to June 2007, Lucid also held the international record for the most days spent in orbit by any woman. Lucid is the only American woman to have lived and worked on the Russian Mir space station. Her stay lasted more than 188 days, which was the longest mission of any American aboard that former orbiting outpost. Among other duties as part of the Astronaut Office, Lucid frequently served as the capsule communicator on space station and space shuttle missions, and many will likely remember her distinctively cheerful voice as the go-between for the crews and Mission Control. "Shannon is an extraordinary woman and scientist," Peggy Whitson, chief of NASA's Astronaut Office at the Johnson Space Center in Houston, said in a statement. "She paved the way for so many of us. She was a model astronaut for long-duration missions, and whether she was flying hundreds of miles up in space or serving as Capcom [capsule communicator] during the overnight hours for our space shuttle and space station crews, she always brought a smile to our faces. Like so many others, I always will look up to her." Lucid was selected by NASA in 1978, and graduated with five other women as the agency's first female astronauts. Her first three shuttle missions, STS-51G in 1985, STS-34 in 1989, and STS-43 in 1991, deployed satellites, including the Galileo spacecraft to explore Jupiter. Her fourth shuttle mission, STS-58 in 1991, was designed to conduct a series of medical experiments and engineering tests. 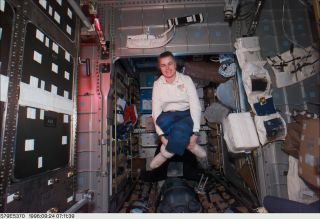 In March 1996, Lucid visited Mir aboard the space shuttle Atlantis on its STS-76 mission. There, she performed a variety of science experiments before returning aboard Atlantis in September 1996 on the STS-79 mission.